What’s going wrong at Manchester United? Something is clearly wrong on the red side of Manchester. United have made their worst start to a season since Sir Alex Ferguson faced the sack back in 1989 and Jose Mourinho is doing little to dispel the notion that clubs under his stewardship must wrestle with a third season syndrome, where everything seemingly collapses, having previously alienated himself from the players at Real Madrid and Chelsea. Here then we are going to examine what exactly that third season has looked like so far. For the purposes of this analysis, we are going to be looking only at what Manchester United do on the pitch, except for the occasional reference where it may be relevant, as anything else would be conjecture – maybe he’s lost the dressing room, maybe he hasn’t, we aren’t a part of it and only have the rumours of journalists trying to sell us stories to go on, so I personally consider discussion of it pretty pointless. One of the main criticisms levelled at Mourinho is that, despite heading into his third year at United, it’s still unclear how exactly United are supposed to be playing. They may maintain the same 4-3-3 formation for most games – although Mourinho has sometimes switched to a 3-5-2 – however it’s hard to pinpoint a discernible playing style. 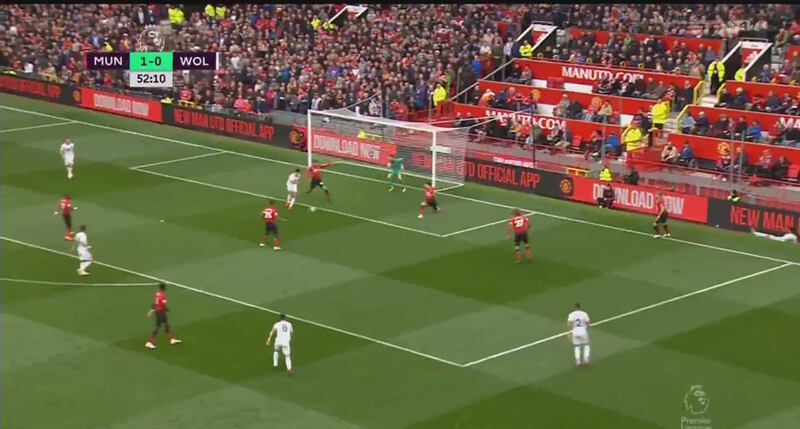 It’s quite revealing that they often look at their most comfortable when Marouane Fellaini is pushed forward to win long balls forward, but that’s not exactly an identity that a club like United are keen to accept. Without a clear idea, we are left only with the idea that Mourinho usually instills in his team and how United relate to that. The two main features of prior Mourinho teams have been rapid counter-attacks and a strong organised defence. Frankly neither has been on display at United this season: they are slow on the ball and have already conceded 12 goals in just 7 league games – to compare, Mourinho’s 2004/05 Premier League-winning Chelsea side conceded just 15 goals in 38 games. So assuming Mourinho has been attempting to replicate his previous successes, what has stopped United from playing in that way? One of the main issues United have faced when trying to counter-attack is how immobile their squad is. 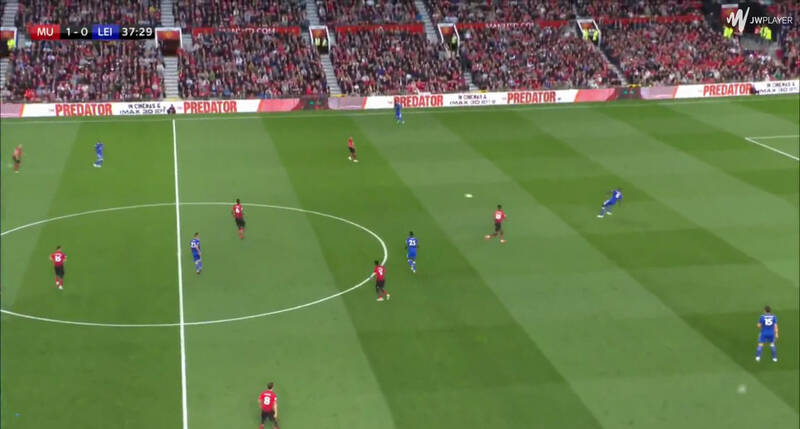 The likes of Fellaini, Nemanja Matic, Antonio Valencia and Juan Mata are simply too slow to sprint the length of the pitch and catch the opposition defence off-guard. That said, United do have players who possess that speed: Paul Pogba, Romelu Lukaku, Alexis Sanchez, Anthony Martial, Marcus Rashford, Jesse Lingard, Fred and Luke Shaw are quick enough across the ground to pose defenders problems, so why aren’t they more successful on the counter? A major problem is how deep United defend. Both wingers are expected to track back deep into their own half and the midfielders frequently drop back into the defensive line or just in front of them to stop crosses. 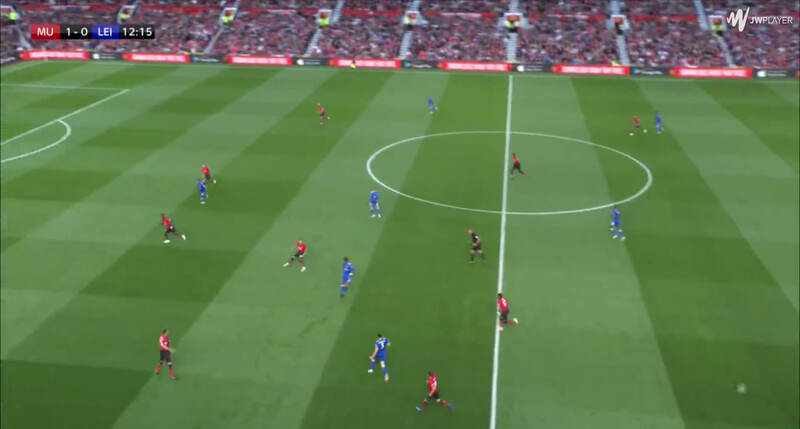 As a result, United often find it difficult to spring forward because most of their players literally have to run the entire length of the pitch to do so. Lukaku is frequently the only man left forward and despite his excellent hold-up play, even he struggles to hold off defenders when he has such little support. Lukaku being the sole man left forward brings another issue to the forefront. There’s a real lack of passing quality at the base of this United team – few of the defenders or midfielders have the ability to pick out a long pass. 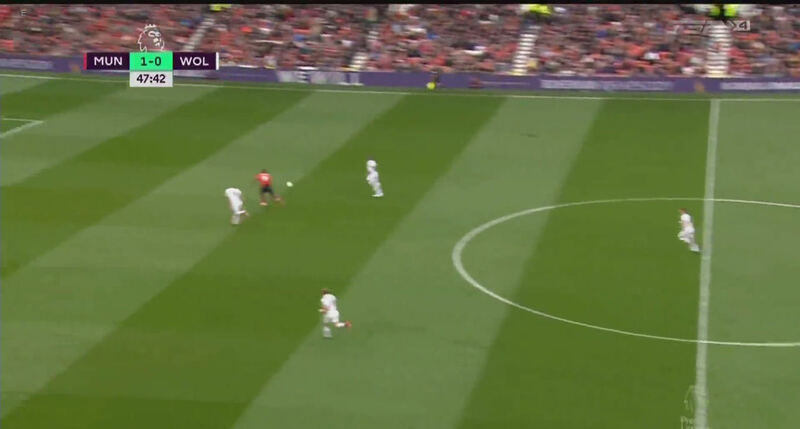 If Lukaku is to have any hope of holding up the ball, it can’t just be a hoof forward, it has to be a quality pass, and only Pogba really possesses the ability to pick those passes out. 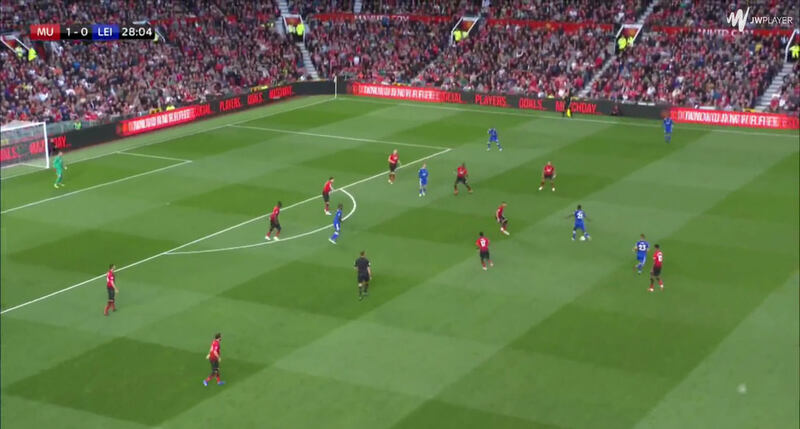 As Pogba has to be the man making that pass to start the counter, he can’t immediately run forward to join it, meaning there’s a lack of support from the midfield. Fred’s running threatened against Tottenham Hotspur, but Matic and Fellaini aren’t going to be winning many foot races, Ander Herrera has barely had a look in and Andreas Pereira has been playing as the holding midfielder. This means that generally only the three attackers are likely to be able to join the attack, less if one of those men is Mata and even less if the wingers have had to track back close to their own box. The odds may not be stacked in their favour, but Pogba’s quality passes and Lukaku’s quality hold-up play, supported by the wingers if they haven’t had to track back too far, do sometimes allow United to break forward. Even then those counters are still rarely effective though. This comes down to the types of players that make up United’s frontline. Lukaku is the most suited: quick, powerful and intelligent, drawing away defenders to open up space for his teammates, but he can often be left lacking technically, slowing down attacks with a bad first touch or killing them with a misplaced pass. Sanchez is suited on paper, quick and technical, but him playing on the left makes it hard for him to stretch play – being right-footed means he has to come inside or cut back to move the ball on so defenders never have to worry about him going down the outside and as a result he’s quite predictable, with defenders just having to stand him up to slow down the attack. Martial is more willing to go down the outside, but being right-footed means he faces the same problems as Sanchez, while his lack of defensive discipline means Mourinho is rarely willing to pick him anyway. Rashford often features on the opposite flank and him being on his stronger foot means he faces none of the problems of Sanchez and Martial – he can go inside and outside of his full-back and the threat of his pace often wins him space. He is very much a striker though, his final ball frequently found lacking, although he lacks the ability to hold up the ball to flourish in the central role. Lingard is similarly unsuited. He’s quick and intelligent enough to pose a threat, but he lacks the finishing touch to do so consistently. He’s the kind of player to act as a link between the players who are going to score the goals or provide the killer passes rather than doing it himself, while he also has a preference for coming inside that can narrow an attack. United possess players that mean a counter can work, but not to such a quality that it can be their main gameplan – none of them are Arjen Robben at Chelsea or Cristiano Ronaldo at Real Madrid. 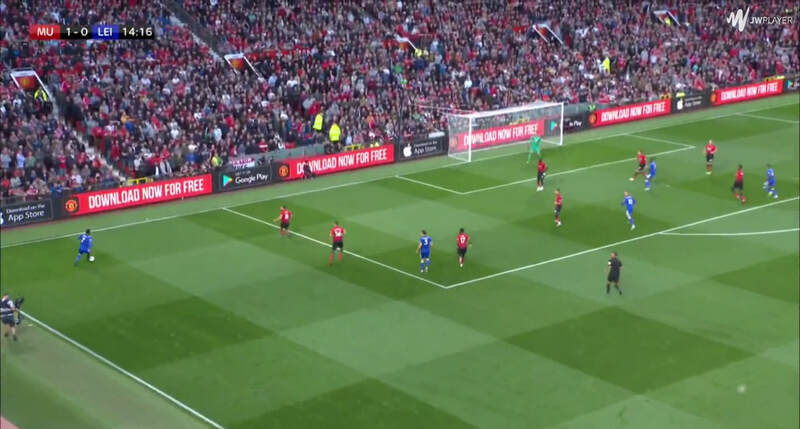 With counter-attacks often falling at the first hurdle, United are forced into taking more patient routes to goal, but this immediately poses them problems. Firstly, United’s backline and midfield generally isn’t packed with quality on the ball. Only Victor Lindelof seems to be a notable passer from the centre-backs, with the rest ranging from fine to poor. Ahead of them none of Matic, Fellaini or Scott McTominay have an eye for a pass, or at least quick enough feet to play it, and while Fred is an upgrade on them, capable of running with the ball and a better passer, he isn’t anywhere close to being as creative as a player like Pogba. Herrera is similar and has barely had a look-in, whereas Pereira has only featured as the holder, limiting his ability to link play as he sticks close to the centre-backs. This means United are heavily reliant on their World Cup-winning Frenchman. Often Pogba will push forward between the lines to link up with the frontmen only to then have to drop back and pick up the ball when it becomes clear no one else is going to pass it forward. Pogba having to be at the base of the midfield if the ball is going to get played forward leaves them with one less attacker, and one of their best, in a position to threaten the opposition defence. Pogba can power and dribble past players, fire thunderous shots at goal and play quick one-twos with attackers, but the lack of quality in United’s build-up means more often than not we only get to see his long passes from deep. Having one less player in attack also makes it easier for the opposition to defend, which in turn puts even more pressure on Pogba: if his pass isn’t perfect, the opposition can easily claim back the ball. This is then worsened by what we can assume are further instructions from Mourinho. 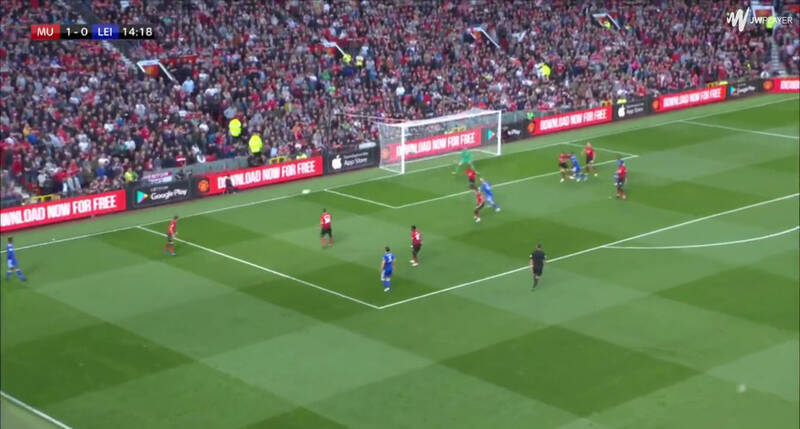 First station ball refers to the pass from the centre-backs into midfield and the logic behind Mourinho wanting to limit them is sound: the receiving midfielder is likely to be facing his own goal, making it harder for him to be aware of a player pressing him from behind, and to play forward he must turn around, which is again risky if he’s unaware of what’s behind him. Losing the ball here is also very dangerous, as it allows the opposition to attack the United backline straight away. 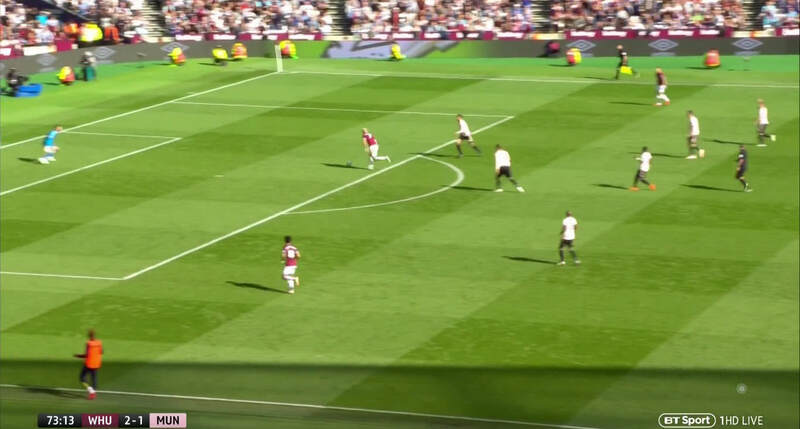 If the passing player is Smalling and the receiving midfielder is Fellaini, then the chance that United lose the ball here, exposing the backline, is quite high. 1) The game is won by the team who commits fewer errors. 2) Football favours whoever provokes more errors in the opposition. 3) Away from home, instead of trying to be superior to the opposition, it’s better to encourage their mistakes. 4) Whoever has the ball is more likely to make a mistake. 5) Whoever renounces possession reduces the possibility of making a mistake. 6) Whoever has the ball has fear. 7) Whoever does not have it is thereby stronger. 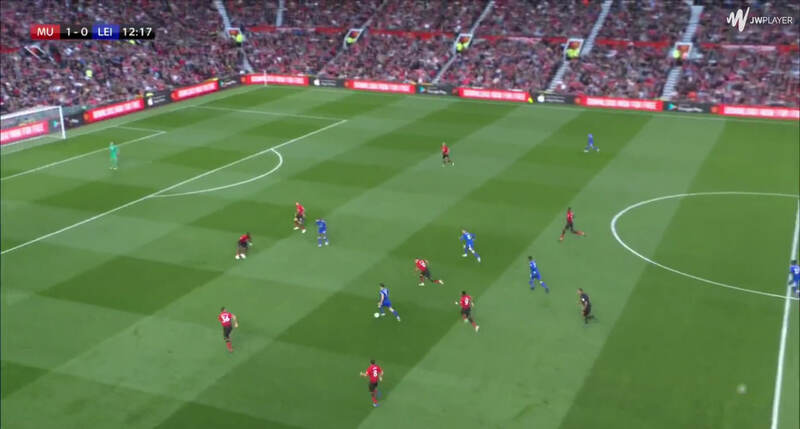 Mourinho has mentioned this only occasionally in regards to pressing teams and Torres (if he can be believed at all) only talks about big games, but watching United it’s striking how infrequently the centre-backs pass into midfield even if there’s an easy pass open. 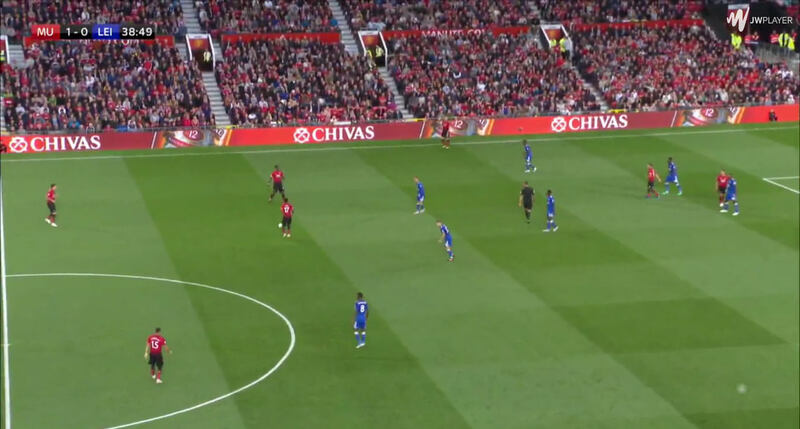 They will pass to a midfielder but that midfielder often has to come all the way back to collect it from their feet, meaning no advantage is gained from the pass – all the opposition players are still behind the ball. Rather than passing the ball into midfield, the centre-backs will pass it out to the full-backs, making United’s build-up very predictable, or hit a long ball forward, which is easy for the opposition to defend. Instead of the blistering counter-attacks of yesteryear, Mourinho’s matches are now made up of slow passing from left to right along the backline and back again before finally hitting the ball long. 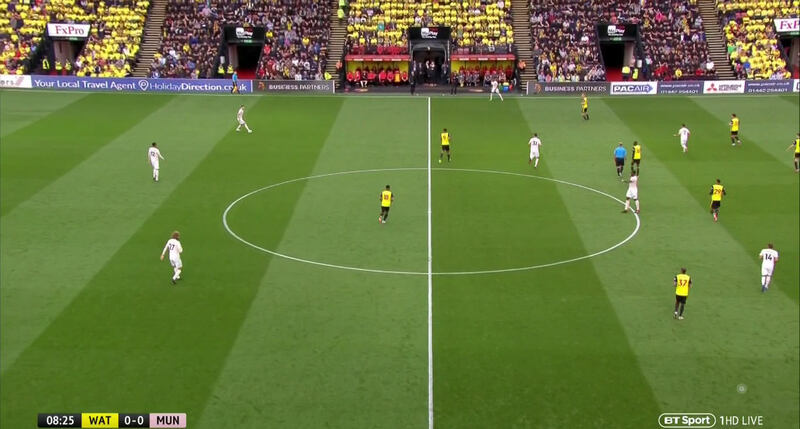 This set-up makes it near impossible for the midfielders to get involved creatively, but it also has the knock-on effect of forcing the full-backs to stay deep in the build-up. 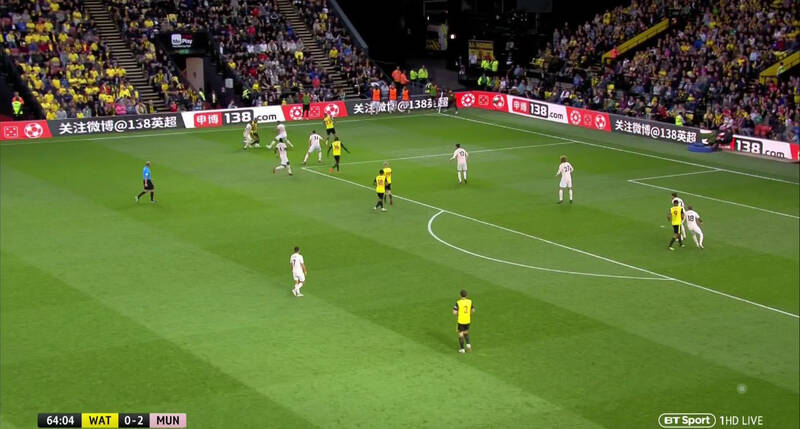 If the ball has to go through the full-backs to go forward, then it follows that those full-backs have to be in a position to receive the ball from the centre-backs, meaning they have to come deep rather than getting high and wide early on in the build-up to support the attackers. Is it really any surprise then that United look at their most functional when they push Fellaini forward to win long balls? Only really Lukaku has much chance of winning the aerial battles for the long ball out of the attackers, but Fellaini is pretty much guaranteed to dominate in the air, meaning United can hit the ball long toward him and have an excellent chance of immediately getting the ball in attacking areas in the final third. 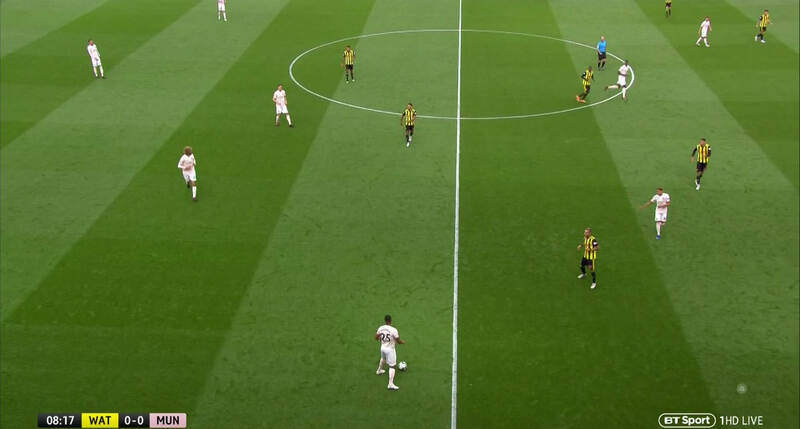 This means that the defence and midfielders can do away with finding a way of somehow getting the midfielders on the ball without passing to them – the full-backs and midfielders can simply push forward to bolster the attack. The main issue for United is that it’s ugly, considered unbefitting for a club like theirs, but it’s certainly more effective than their usual set-up. 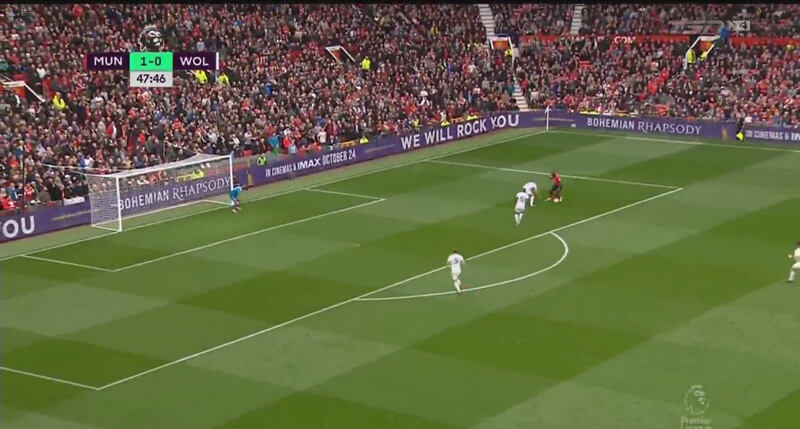 Although posing more of a threat, long balls to Fellaini don’t magic away all of United’s attacking problems – they just make it easier for United to get into the final third. Once it’s there they still have problems breaking down the opposition defence. Sanchez’s lack of form has been a major disappointment for United, and patience seems to have run out after he was left out of the squad for the loss to West Ham. The Chilean isn’t blameless – he seems to misplace every pass and unwilling to run in behind the opposition defence unless someone plays a one-two with him first – but would he be more likely to do those things if he was played in a system that played to his strengths? The first problem for Sanchez is that he’s right-footed and playing on the left – this right-footedness makes it very difficult for him to go down the outside of his full-back, instead having to come inside and receive the ball to feet. This insistence on coming inside then poses him a problem as he rarely has anyone to link with. Sanchez can look quite good when Pogba is able to get forward and Shaw can scare the defenders on the outside as he has more space and people to exchange passes with and work his way behind the defence, but that pair are frequently at the other end of the pitch. Lingard and Mata will often move across to give him someone to exchange passes with but playing as right wingers means they are often required elsewhere, while Rashford will stick to the opposite side. 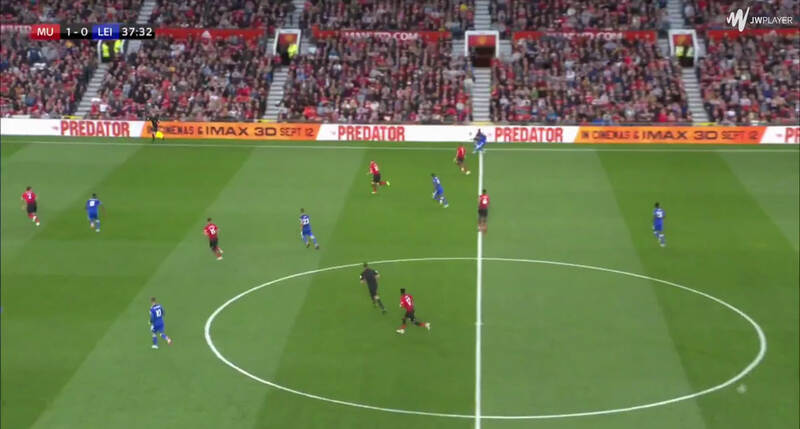 When playing as a striker in the opening game against Leicester, Rashford was willing to come across and play one-twos with Sanchez to get him running in behind, but Lukaku prefers to make runs towards the back post which leaves Sanchez with no one to work with nearby. 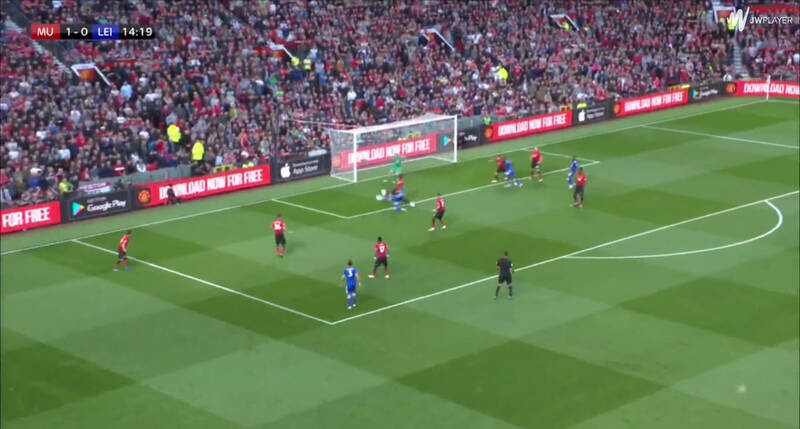 Without anyone to link with and difficulties running outside, Sanchez’s options are to cut onto his right foot and swing a cross towards Lukaku at the back post. 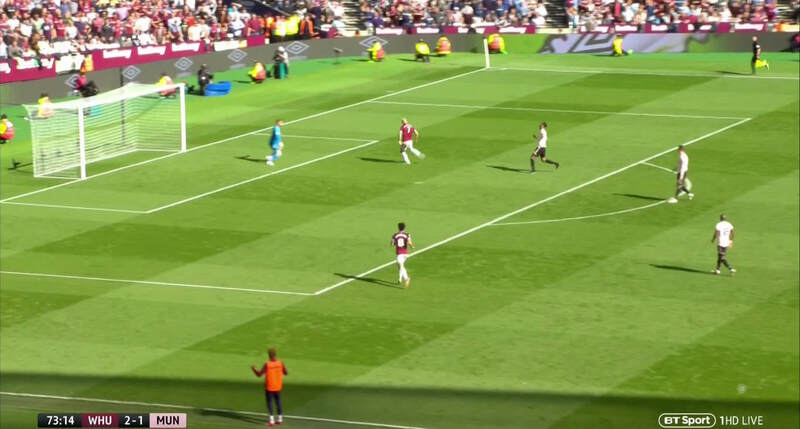 This can work – as the opening goal against Burnley proved – but it’s very predictable for the opposition and doesn’t exactly play to Sanchez’s strengths. The other attackers face similar problems. Lingard’s main benefit is his ability to link play, but United’s problems playing out mean he’s often having to drop all the way back to pick the ball off the defenders and he only has two players to link with in attack, meaning his skillset is largely wasted. Mata is more able to play that final ball into the attackers, but has the same problem getting on the ball in a position to do so due to United’s build-up. Rashford and Martial are the same kind of player. Rashford’s pace and finishing make him a danger but as a natural striker his crossing isn’t the best, which is a problem when he’s only got a handful of players to aim at against a packed defence. Martial is more talented, more able to link up with the other forwards, but his lack of defensive discipline means Mourinho is rarely willing to give him an opportunity. Lukaku is United’s greatest attacking threat and his ability to hold up the ball is invaluable, but his lack of technical ability means he can’t be relied upon to link with or play in the other attackers. There’s little quality coming from behind them though. Pogba is obviously talented and Fred looks like he can add something when given the chance – although he has an unfortunate habit of moving towards Pogba, offering no attacking benefit and limiting his teammate’s space to pass or dribble out – but too often they are stuck deep. Shaw has been one of United’s stand-out performers so far, bombing forward down the left, but none of the other full-backs offer anything close, except for possibly Diogo Dalot, who has barely featured. Former centre-back Matteo Darmian is solid defensively but offers little going forward; Valencia is a converted winger but no longer has the legs to get down the outside of his defender; Ashley Young at least makes moves to threaten to beat his man, but rarely actually does so and at 33 probably doesn’t have the legs to do so either, while when playing on the left he’s forced into cutting inside onto his right foot to cross, slowing down any attack. 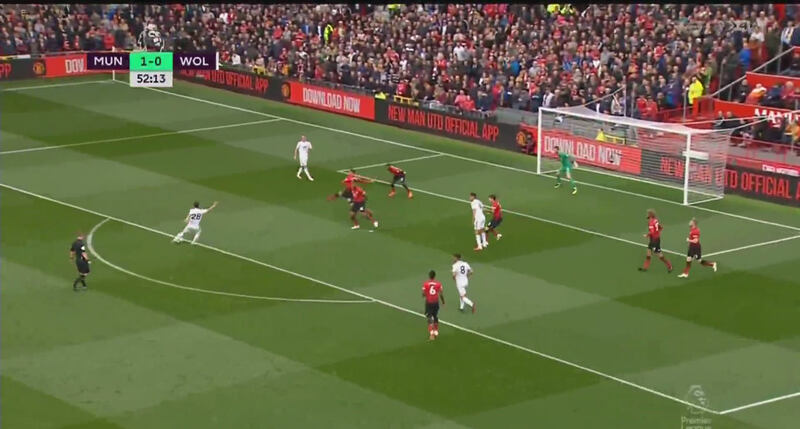 Unable to stretch the opposition defence, United’s attacks often regress to simply flooding the box with players and sending in a cross from deep. The height of Fellaini, Pogba and Lukaku means this can pose a threat, but they aren’t exactly golden chances. So it’s obvious: why doesn’t Mourinho do as Pogba said and “attack, attack, attack”? Split the centre-backs, push the full-backs forward to stretch play, put Pereira and Fred in midfield to move the ball forward, push Pogba forward to link with Sanchez and set up Lukaku and unleash Martial’s potential on the opposition defence – simple. Brendan Rodgers faced a similar problem trying to find a balance between attack and defence at Liverpool in the 2013/14 season, scraping by in the first half of the year on the goals of Luis Suarez and Daniel Sturridge. His solution was to simply go all out attack from January onwards, finding his team had the attacking ability to overpower most of the league. United’s best performance this season came in the first half against Tottenham Hotspur, and that was one of the few times they played aggressively, pressing high up the pitch rather than retreating into their usual deep 4-1-4-1 block. 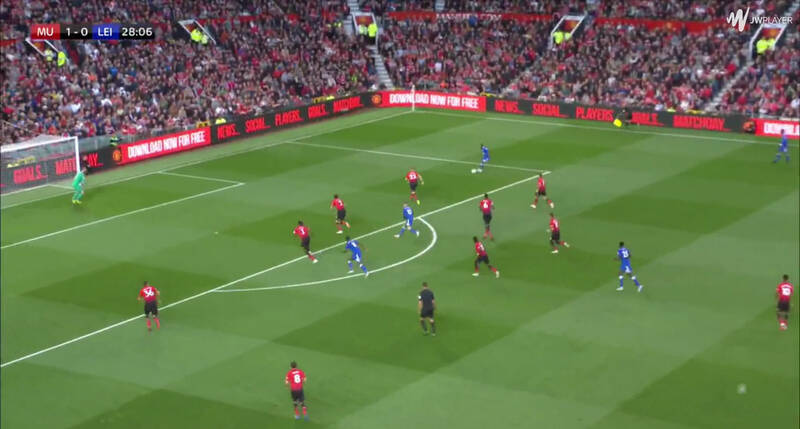 Mourinho has also stated that his use of midfielders in a back three is to add “quality on the ball on the building up from the back“, allowing the centre-backs to spread out across the pitch without leaving a massive gap between them for the opposition to target if the ball is lost. Why doesn’t Mourinho try that more often? The two most obvious answers are that Mourinho has always preferred a more defensive style and that United lost that game – getting thrashed isn’t exactly a great example that it’s a working strategy. United do sporadically press high up the pitch with man orientations but for that to work each player has to be strong defensively and willing to do that work. Some players simply aren’t. Martial and Pogba often don’t bother to track their men, giving the opposition an easy way of playing around the press. Matic and Fellaini are strong and can outmuscle most players but they are also immobile, meaning they can get left behind with some clever movement, while a general lack of understanding between players can often leave a man free. The use of man orientations rather than a more zonal system means that while United’s players are closer to opposition players giving them less time on the ball, large gaps can open up between them as the opposition moves around, opening up easy passes straight into the opposition forwards, who can then attack the United backline. That backline is United’s main problem though. Put simply, almost none of them are good enough. Valencia is fine – strong enough to win challenges and aware enough that his fading legs aren’t a big issue, but his real problem is in attack – much like Darmian who has only appeared once. Young has clearly worked hard to convert himself into a full-back but it’s clear he isn’t a natural defender, struggling both technically and with his awareness as outlined in our profile of England. Shaw has also worked hard to improve after coming under heavy criticism from his manager, but he also struggles with his awareness, shown perfectly by the opening goal in the loss to West Ham. Dalot hasn’t featured enough to adequately judge, but throwing a 19 year-old into this mess of a defence seems like a good way to ruin a career before it’s really started. The centre-backs aren’t much better. Phil Jones has the same problems with his awareness that have ensured he’s barely played. Lindelof has a tendency to stay very close to his man that can make him easy to draw out of position, plus he’s weak, with strikers easily able to shrug off his challenges and dump him to the floor (without wanting to go too far into intangibles, he’s also clearly lacking confidence which will hardly help). Smalling is strong in the air and clever, but he can easily be wrong-footed by some good dribbling or a quick change of direction, while Eric Bailly has the most obvious defensive ability: quick, aggressive, good positionally, strong in the air and along the ground. The Ivorian’s only problem is that he’s still fundamentally a reactive defender – he shows a good awareness of his surroundings that mean he’s rarely caught out but he’s currently reacting to what his opponents are doing rather than being proactive to cut off the opportunity straight away. This quality is likely to come with age, having experienced the same situations thousands of times, but at 24 he needs help. Both Bailly and Smalling are talented enough that they could easily grow and flourish with a senior partner alongside them to walk them through games, but with United’s troubles their weaknesses are only being exposed. The decision not to sign Toby Alderweireld makes sense for United: the transfer fee and contract could have easily added up to over a £100million for a player who, at 29, probably only has a few years at the top left. He is however one of if not the best centre-back in the league. He could easily be played alongside Bailly or Smalling and make them better – you need only look at how Virgil van Dijk has helped cover for the poor decision-making of Dejan Lovren to see how much a player relies on those around him for how successful he is. Instead United appeared to be more interested in Harry Maguire, who is talented but like Bailly probably needs someone better alongside him to help him develop, and ended up signing no one at all. Although all of United’s defenders can be found lacking, Mourinho hasn’t helped matters. Only one back four has appeared more than once – Valencia, Smalling, Lindelof, Shaw against Burnley and Wolves. How exactly can these already struggling defenders be expected to form an understanding if they are changing every week? How exactly can they be expected to help cover for their teammates’ weaknesses if what weaknesses they have to cover change every week? 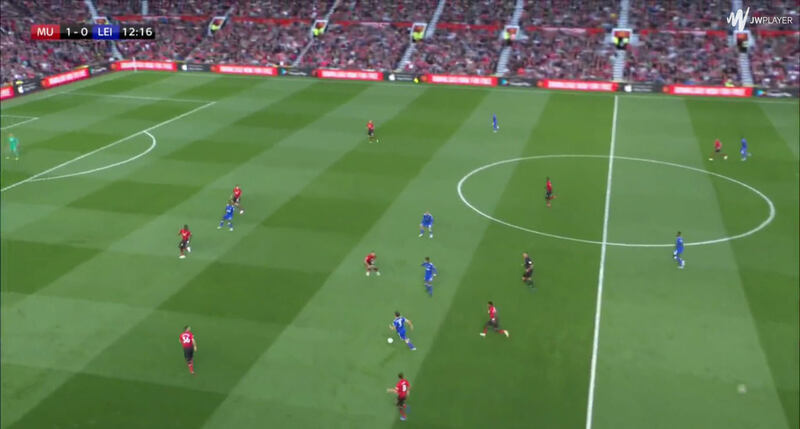 Mourinho’s answer is to simply sit deep, restricting the space for opponents to use if they do make a mistake, and have the midfielders cover any gaps that open up between them. 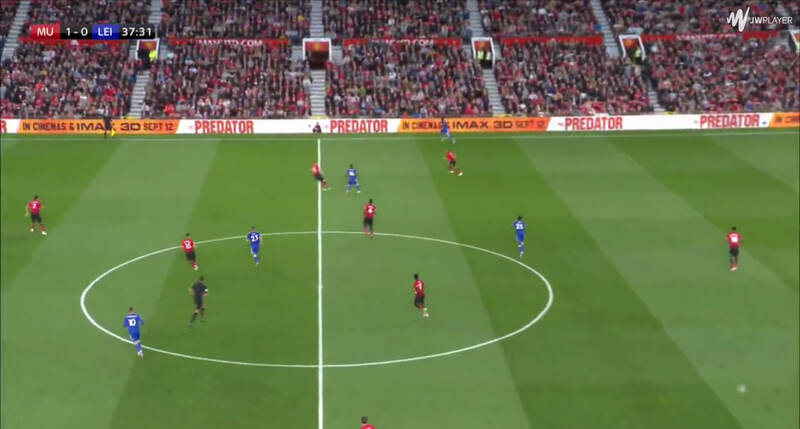 One midfielder will move across to screen the half-space when the ball goes wide, dropping into the backline if anyone looks to make a run in behind the full-back, while either Matic or Fellaini will drop into the backline to bolster the aerial presence in the box. 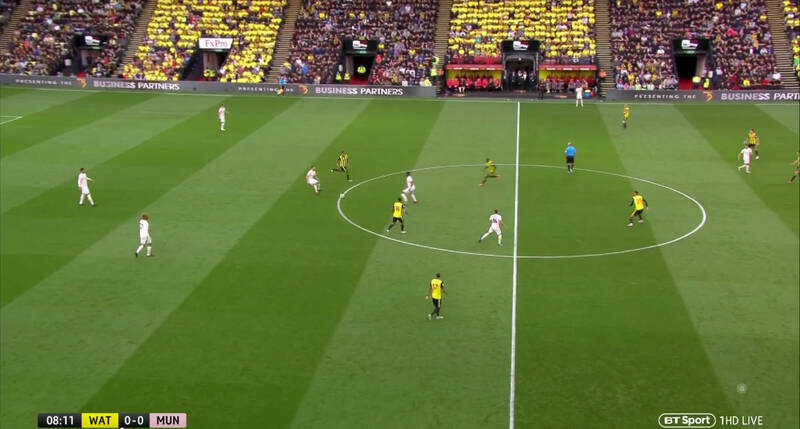 This essentially requires that the midfielders have to be strong defensively. Pereira started the season at the base of the midfield but was dropped when he was found defensively lacking despite making a good effort, while Herrera has barely featured after poor form last season and struggles with injury. Mourinho is essentially forced into playing Matic or Fellaini in midfield instead of a more creative option to help plug the gaps in the backline. 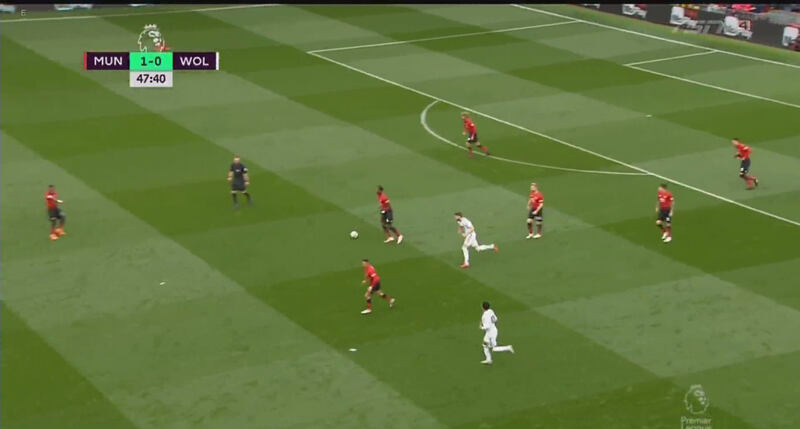 This cedes the space in front of the defence to the opposition though: either they can play into the middle or they can regain the ball on the edge of the area with little opposition when a United player heads away a cross. Joao Moutinho is left free on the edge of the area. United are in a good position to block the shot, although he still scores. It’s also worth noting how little Pogba has moved to help. 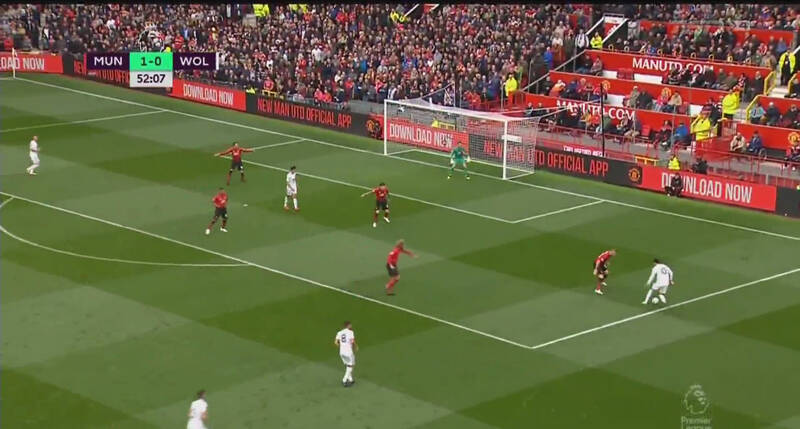 This is obviously dangerous for United as their opponents have plenty of freedom close to goal, but the packed backline helps to narrow the gaps for the ball to be played through and David de Gea is such a good shot stopper that he’s often able to stop everything thrown his way. United struggle with winning the second balls at the other end too. 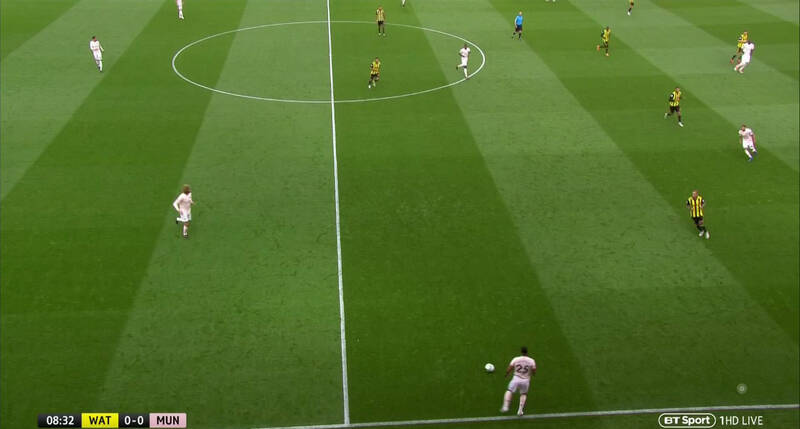 They flood the box with players to make it more likely that they score from a cross, but then there’s no one outside the box if it’s headed away, allowing the opposition to counter. Although one of the world’s best shot stoppers, De Gea offers little if United are caught high up the pitch. He prefers to stay near his line rather than sweep up behind, making it even harder for United to press, which goes some way to explaining why he struggles to replicate his club form for Spain. A lot of the blame for the disastrous start to the season must fall upon Mourinho, whose style has limited United’s best players and whose abrasive personality has only made the situation more toxic, but the problems don’t simply go away if he’s sacked. They date back all the way to when Sir Alex Ferguson was in charge and were covered up by the goals of Robin van Persie. United’s squad is packed with players who aren’t quite bad enough to discard but not good enough to make a positive difference – many of them would be successful if they were surrounded by world class players, but they are made to look worse by most of them being of around the same standard. United need to stop settling for very good but not great players – it’s the same acceptance of mediocrity that plagued Arsenal and Liverpool in the first half of this decade. A major issue though is the limitations of United’s most talented players. If Mourinho is to succeed there needs to be some kind of compromise between him and them. Mourinho has every right to expect that the likes of Pogba and Martial make more of an effort to defend or that Sanchez can complete a simple pass, but they also have every right to question why their manager is setting them up so that’s it’s so difficult to attack. Neither side seem the type to give any concession, so it’s hard to see them turning this season around.